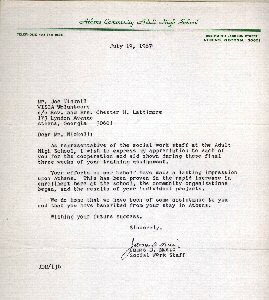 As a VISTA Volunteer (part of President Lyndon Johnson's War on Poverty), I was a community organizer in Georgia. That is, I went door to door, leafleted and otherwise organized meetings at the grassroots level to address poverty, civil rights, and other important issues. Following active training in Atlanta and at Athens, Georgia, I then spent a year as a Community Organizer in Carroll County, specifically assigned to Villa Rica. (See Poverty Program Worker.). I am proud of this work, and so I recall with disgust how at the 2008 Republican National Convention former New York mayor Rudi Guiliani made fun of Barack Obama's background in community organizing, giving the ex-mayor the appearance of a snickering elitist.